A bright, purple rim leads to an almost black core. The nose is offered blue and black fruits with an array of secondary aromas. Steeped blueberries lead the way followed by crushed, black currants. Cracked black peppercorns and smoked meats create an ultra-complex wine. 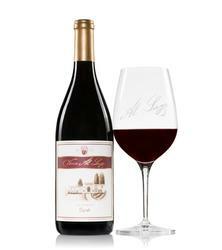 Hints of vanilla and shaved dark chocolate add to the wine, creating a perfectly balanced wine. The chalky tannins dissolve quickly allowing the palate to enjoy the many flavors found in this wine.